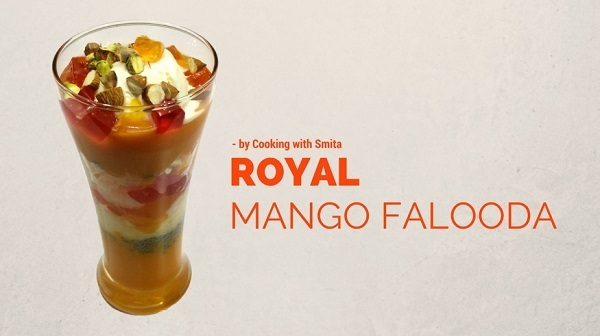 Here’s my another Falooda Recipe with a delicious taste of Mango with Dry Fruits – Royal Mango Falooda. It is made in layers with various flavours & textures with ingredients including Mango Puree, Jelly, Milk & Ice Cream. Try this heavenly Royal Mango Dessert during summer with this step-by-step recipe guide. Take a large serving glass. Then make layers of Falooda Sev, Mango Jelly. Orange Jelly and Strawberry Jelly. Again add some more Falooda Sev. Now add chilled sweetened Milk. Add some chopped Mangoes and Dry Fruits. Make a layer of Mango Puree. Add one scoop Ice Cream. At the top, add some Jelly and Dry Fruits.